I’ve given up my morning coffee. It feels unreal to type that. If a few years ago you asked me the likelihood of me giving up coffee, I would have said I was as likely to give up coffee as I was likely to give up breathing, discussion over, thanks and pass the French press please. But we’re in the future and hi, it’s me and I’ve given up caffeine aside from the occasional decaf cup. My affair with coffee began, as many do, when I went to college. I began drinking it solely for the caffeine element, but I grew to love the taste as well. Since then, I’ve drunk coffee regularly and religiously, with zeal and passion. Coffee was a primary food group in my diet for the better part of the last decade. I actually feared being stranded without coffee to fuel my morning and day. All that changed last fall when I realized coffee interfered with with my health. Instead of giving me a warm and cozy boost of energy, coffee left me feeling anxious, run-down, foggy-headed, and not very pleasant to be around. My old friend had turned on me. The time had come to cut the caffeine dependence cord. I had trouble at first, but the problem wasn’t the much feared caffeine withdrawal. The morning ritual of coffee is something I love. I love the practice of making coffee. I love sitting down with a warm cup and the french press. All that to say… I decided to do as the Brits do and start drinking tea. Make mine herbal please. I don’t drink tea every morning, but some days I need the ritual of making a nice warm drink, holding the mug in my hands, breathing it in, and sipping it slowly. This rooibos (ROY-boss) latte might be my favorite iteration of tea time yet. If you’re not familiar with rooibos tea, it’s naturally caffeine free and has a really lovely mellow taste. There’s also less tannin in rooibos. As a result, it doesn’t have that drying effect in the mouth like black or green tea, but it still has that tea-like (for want of a better description) flavor that you might miss in an herbal spice blend tea. I got the idea for the vanilla bay rooibos latte from the fantastic Boston-based bakery, Sofra. 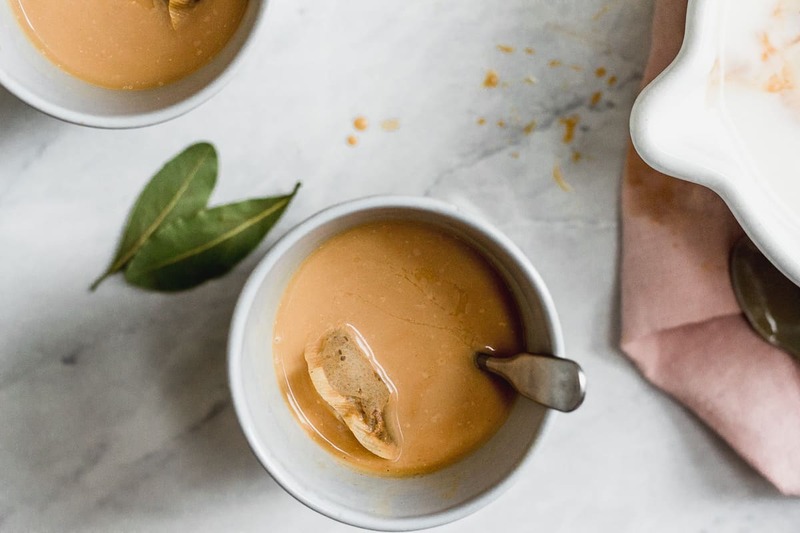 They have a rooibos latte on their menu that is out of this world, so I set off to create something similar at home. The really special thing about their latte is that they use a vanilla & bay leaf infused syrup to sweeten it. It’s earthy and warming and perfectly matched with the rooibos. 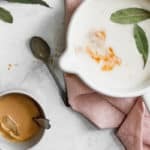 When I set out to make this at home, I chose to simply infuse my almond milk with the bay and vanilla instead of making a syrup and it worked beautifully. 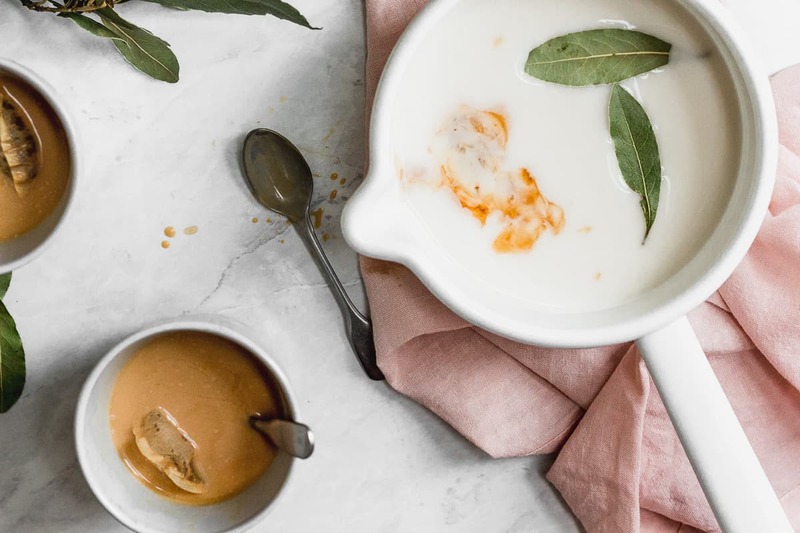 While I love this with almond milk, you could really do this with any milk you like– cow’s, oat, hemp– although I would caution against coconut milk. I tried it and the coconut really overpowered the subtle vanilla and bay flavors. 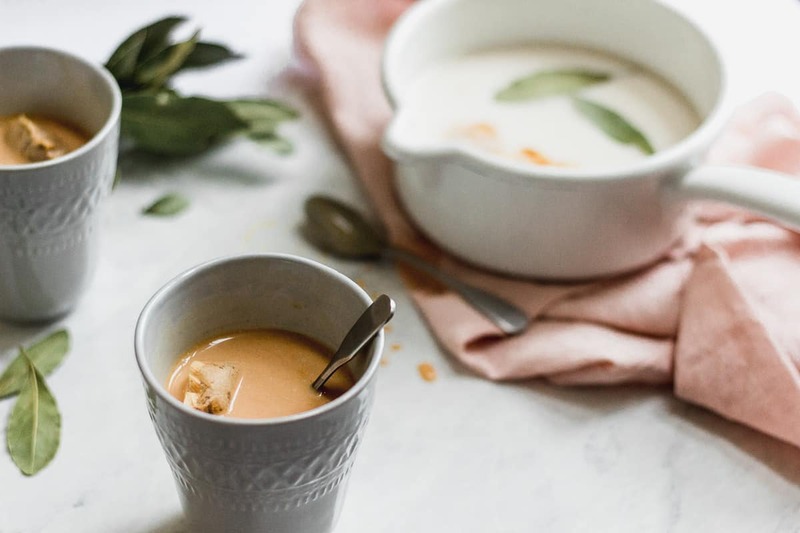 This vanilla bay rooibos latte is a delicious rich drink with subtle spice. It’s the perfect warming tea and can just about replace coffee for me. Bring milk, vanilla and bay to a simmer on med in small pot. Reduce to low, stir in the honey and let the mixture barely simmer for 5 mins. Remove the pot from the heat from heat and add tea bags. Let the tea steep for 5 minutes. Remove the tea bags and the bay leaves, pour into two tea cups and enjoy! *Note: If you want to make the vanilla bay infused milk ahead you totally can. Just simmer the milk mixture, don't steep the tea bags in it. Instead let it cool completely, transfer it to an airtight container, and put in the fridge until you're ready to make your latte. 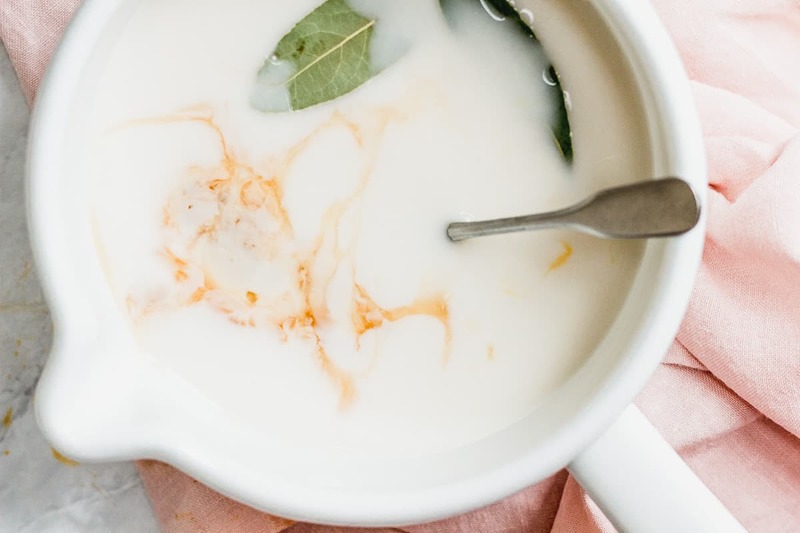 When you're ready for tea time, reheat the infused milk over low heat just until it's about to simmer, remove it from the heat and continue with step 2 above.